Designs by Lisa Somerville: GS86 Coffee Filters and Some Exciting News! GS86 Coffee Filters and Some Exciting News! Keeping with this months Coffee/Tea/Cocoa Theme, the GS86 Spicy Supply Challenge is Coffee Filters. I can honestly tell you I have never reached for a Coffee Filter before when creating my cards, but after playing around with different techniques and ideas, I'll surely be reaching for them in place of Tissue Paper! After many attempts to create something with the Coffee Filters, I decided to spray mine with Ranger Butterscotch Colorwash, crumple and dry with a Heat Gun. Once dry, I adhered it to a piece of card stock that I ran through my Xyron, smooshed out the wrinkles a bit then stamped the Damask randomly in Black Archival. I applied Rusty Hinge DI over the raised area, then spritzed with Ranger Perfect Pearls Mist. 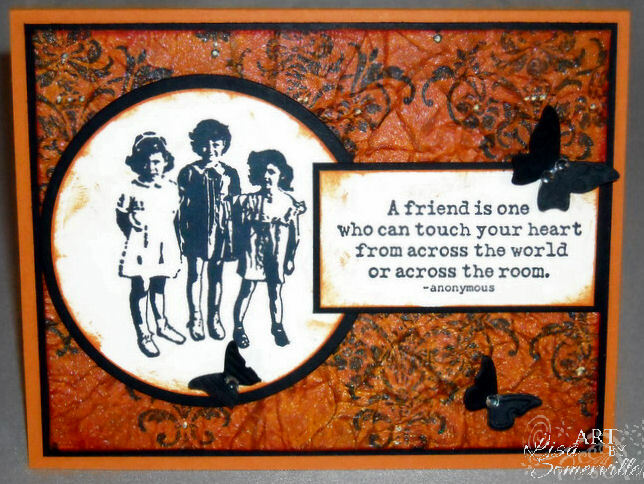 The image and sentiment are from Stampotique. If you looking for some fun challenges, stop by Gingersnaps and play along! My exciting news.... I've joined the Stampotique Design Team! I'm excited to be working with this uber talented group of designers! Be sure to stop by and check out the other members of the team. 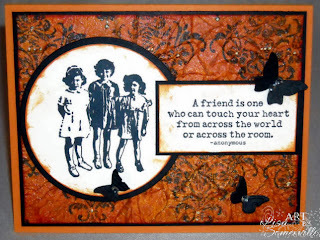 Stampotique has a fun Challenge going on right now for a chance to be a Stampotique Guest Designer, check it out here! Whoo Hoo! Congrats! Looking forward to more beautiful work by you using their stamps! Gorgeous card, Lisa, and a big Congrats on the Stampotique DT!!! I adore their line of goth kids and critters... can't wait to see what you come up with! GORGEOUS background Lisa! Congrats on the new DT. Lovely, Lisa! Love the background! Congrats on your new DT! You'll really make the Stampotique images shine! Doin' the happy dance, congrats! Beautiful card, luv the coffee filter bg, it makes the card. I definitely need to run for the coffee filters and use some up now after seeing how awesome this looks. Great job and WELCOME to the Stampotique team, we are thrilled to have you! Huge congratulations Lisa your news is brilliant. Congratulations on joining us - looking forward to seeing more of your work. Love this card! Lisa, this is a lovely card. I have been playing with my coffee filters to, but now I have some inspirtation. Thanks for sharing. Wow- this is a great card- what fun with a coffee filter....! Huge congrats! on your new DT gig ... can't wait to see what you create with their awesome stamps. Congratulations on your new DT position! You've been making gorgeous cards for years and you totally deserve the recognition! I just LOVE the background on this card today - it was well worth every minute you spent creating it! Fabulous card! That background is wonderful! Congratulations Lisa!! I am so happy for you! The background your created is so beautiful! Wonderful card! Have a great evening! Whoa! That background ROCKS! It turned out great! Congrats on your new dt gig! Enjoy! Beautiful card and congratulation on the DT job. Congrats Lisa on making the DT, Honestly I don't know how you do it all.Your amazing!!!! Love your coffee filter backgrounds. I've never tried them either!